Summer seems like a forever ago. So much has happened since, like this… and other things like, you know, life. Summer and the chaos that encompassed it are now almost a dream. The last of the medical bills have been paid and filed away, and puffy, red scar-tissue is looking less… angry. Children can be easily lifted with no worries of wincing pain. My husband is whole again. Um, well, whole — minus a small section of his small bowel, but who’s counting? I last wrote about Jack’s small bowel obstruction/semi-emergency surgery/hospital stay in mid-August — three months ago. Yikes! I just couldn’t bring myself to finish the story because I just wanted to move on and move away from it. But I never finished the story, and for some reason that has dammed up any other writing. 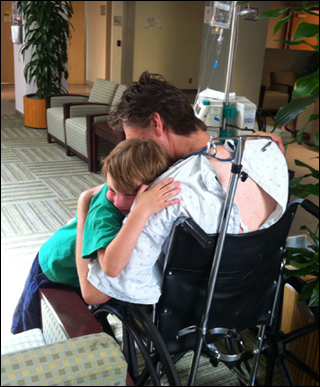 Jack ended up staying in the ICU longer than anticipated. Combine a low pain threshold (c’mon, honey — you know it’s true) with forty years of no previous experience with such intense pain (welcome to post-abdominal surgery hell! ), sprinkle in a hospital bed that is too short for a six-foot-five frame (they eventually found the bed-extender, thank goodness), and you get a doped-up grown man, writhing in pain, who is totally freaked by the complete loss of control over his life. My husband is the most even-keeled person I know. I’m of course very used to this, but to others not quite as knowledgeable about the world of Logic Man, his cucumber-coolness can be a little unnerving.Â A little over ten years ago his then brand new car was broken into in the parking garage of our apartment building. As he surveyed the smashed driver side window, the clearly rifled through glove-box and center-console, the empty spots where once sat now stolen items, he didn’t flip out, didn’t say much of anything, just stayed… well, stayed “Jack-calm,” while determining what next steps needed to be taken. Later in the day, our apartment manager called to ask me how we were doing. “Has he lost it yet?” she asked. That just isn’t Jack’s style. Even with his car vandalized and his property stolen, he still had control over his life and frankly, the situation as it stood before him. But in the ICU, hooked up to multiple monitors, in a kind of pain he could never have imagined and not really knowing what lay ahead of him, he lost it. He desperately tried to maintain control of his situation by asking the nurse lots of questions (which made very little sense, given his medicated state). He wasn’t interested in talking (or being talked to) other than to specify where he wanted his pillows to be placed, how his NG tube should be positioned, etc. He clung desperately to the timing of his medication, as if somehow knowing when he was next due would give him more power over the pain. Initially, I wasn’t going to stay for very long that evening after his surgery. Dad was at home with the kids, but I was bone-tired and figured there wasn’t much I could do for him at that point. But his fretfulness unnerved me, so I stayed. I still couldn’t do anything for him, but I stayed. I stayed until I found my occasional dozing was turning into full-on chair-sleeping. Got home and stared at my sleeping kids for a while. I just want to crawl into Ethan’s bed and hold him closely. The surgeon had told me that Jack would likely be moved out of the ICU in the morning, so I was surprised the next day to find him still there. And yet… I wasn’t really surprised. Not after the previous evening. I just witnessed the RN and CNA (Certified Nurse’s Assistant) do the most efficient sheet changing ever, and the CNA was able to wipe Jack’s back down which was very cooling, I’m sure. Jack has been so worried about moving his body — anxious about the pain, but he did great (and they were great). Second post-surgery day (6/23)… he remained in ICU. His heart rate was on the high side, as was his blood pressure… as was pain level. They did make him sit (much to his initial protest) in a chair for about an hour, which was good, and ended up taking out his IV and giving him a PICC line (which enabled them to give him electrolytes and vitamins, etc., while still being able to administer his regular IV fluids, antibiotics, and pain medication). His mom arrived in, having moved up her already scheduled flight a few days, and sat with him in the hospital while I attended to kid/house/work stuff. Later that night when I returned to the hospital after the kids were in bed under the watchful care of my mother-in-law, he carried on a conversation with me for a good 20 minutes or so before getting tiredâ€”the whole time able to adjust his pillows and shift in bed without assistance. I was fully expecting him to be moving out of the ICU today, but when I got here (a little later than usual as I had an eye doc appointment) his nurse explained to me that his heart was in a-fibâ€”essentially, as I understand it, the atrium isn’t pumping regularly. His life isn’t in danger, of course, but since this is a new development, they want the cardiologist (who had already cleared him) to come back and check him out. Since the cardiologist is on “doctor-time,” we are still waiting to see him. I walked into the room at a little after 9pm tonight and didn’t notice at first, but the NG tube was gone! And the catheter was gone! Jack said the removal of the NG tube was possibly worse than the removal of the catheter. So worth it, though. He got up and walked a little bit, then sat in the chair for about a half hour. The more he can get up, the faster his gut will start moving around, and things inside will head back to normal. Try eating a couple of roasted pumpkin seeds with the shell on — definitely wood-chip-like. Jack can eat quite a large amount of the things in one sitting, and in fact he did… recently. Fourth post-surgery day (6/25)… Being downgraded from the ICU to the Telemetry wing meant that much closer to going home, right? Ha ha ha. Fifth post-surgery day (6/26)… The cardiologist came by and examined Jack. His heart hadn’t done anything weird since that a-fib episode, but they still wanted to keep his heart monitored while at the hospital. GI guy also came by… heard more sounds, but the belly was still pretty quiet. About this time a week ago I was begging my husband to let me take him to the ER. Sixth post-surgery day (6/27)… Jack’s eighth day waking up in the hospital… The surgeon said that the wound was healing nicely, but seemed surprised that Jack hadn’t had more bowel activity, so he went ahead and authorized clear liquids. Jack was very excited about that, as you can imagine. He told me later it was pretty awful tasting (I assume he meant the broth), but just being able to swallow something other than ice chips must have been close to euphoric. The surgeon also mentioned that Jack’s white blood cell count was kind of high, though with the amount of antibiotics they’d been giving him since coming out of surgery, I couldn’t imagine that he could have had an infection. When the surgeon said he wanted to check the white blood cell count again in the morning, my hopes of himÂ comingÂ home the next day were dashed. Nine days in the hospital… probably at least two more to go… sigh. But… sigh. The cardiologist now wants to do an angiogram because the levels of something or other are elevated. An angiogram will put him behind in his progress by about a day or so. It is scheduled for tomorrow morning. My take on it all: if something IS going on with his heart, it is better to find out about it in the hospital, right? I just wish he could come home. We miss him. "Get better soon, Daddy. I love you." Ethan had been handling the separation like a champ, considering he kind of knew what was going on, (Henry and Miranda declared that Daddy was at work, and we left it at that). Every morning I would record a video of the kids saying hi to bring to Jack, and when Jack was feeling up to it, we’d call at bedtime to say goodnight. Ethan was due to leave for Idaho the next day with Jack’s mom, and was concerned aboutÂ gettingÂ to say goodbye, so we arranged for Jack to be wheeled out to the waiting room to see Ethan after day camp. They were both oh-so-happy to see each other. It was hard not to cry, especially watching Ethan watch Jack getting wheeled away at the end. Eighth post-surgery day (6/29)… My boy left for Idaho. My mom flew in. My husband was still in the hospital. Ninth post-surgery day (6/30)… Staples came out. Soft foods, albeit not much (not much of an appetite), were eaten. PICC line was stopped. Jack opted to not have the angiogram, so the cardiologist ran some different tests, the last of which was this afternoon. We are waiting for the results of that test, after which we think he can come home (please please please). Tonight will be his eleventh night in the hospital. Jack is well, but weak. He definitely has muchÂ recoveryÂ ahead of him. Cross your fingers for a discharge tomorrow. Tenth post-surgery day (7/1)… Twelfth day waking in the hospital. PICC line is out, and yesterday’s tests came back with the “all clear.” Now if the admitting doc would just do her rounds, he can COME HOME ALREADY! Heading home from the hospital…WITH MY HUSBAND!!!!! Wahooooo!!!!!! Twelve days in the hospital. Seventeen pounds lost (not a weight-loss plan I recommend). Weeks of recovery at home, followed by shortened work days. By the time Jack was fully recovered, summer was over. And then life happened. And summer became a memory.